A capacitive material moisture meter is a device with direct reading of percentage humidity. The capacitive material moisture meter is in fact, the ideal machine for both professionals and amateurs alike. It can be used to indicate the humidity of the material “u” (related to dry mass) or the water content “w” (related to the total wet mass). The measurement is done on a measuring cell located on the back of the capacitive material moisture meter. The switch on the side changes the depth of the measurement. By measuring at different depths it is possible to ascertain if the material is drying or if it is surface humidity. 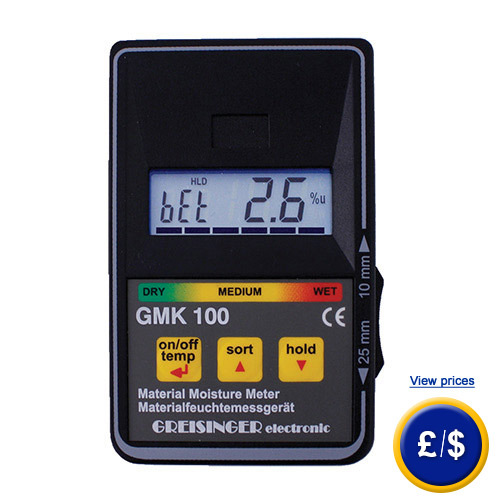 For further information about the Capacitive material moisture meter GMK 100, please read the following technical data or call our Hotline: UK customers +44(0) 23 809 870 30 / US customers +1-410-387-7703. Our engineers and technicians will gladly advise you on the Capacitive material moisture meter GMK 100 or any other product in field of regulation and control, scales and balances of PCE Instruments.